Pattern testing for the Origami Sweater by Misusu Patterns began back in November of 2017. At the time of the tester call, we didn't know that Elles' incredible design would be the cover look for One Thimble 18. It was hard keeping this secret for so long, so it's even more exciting to finally get to share. 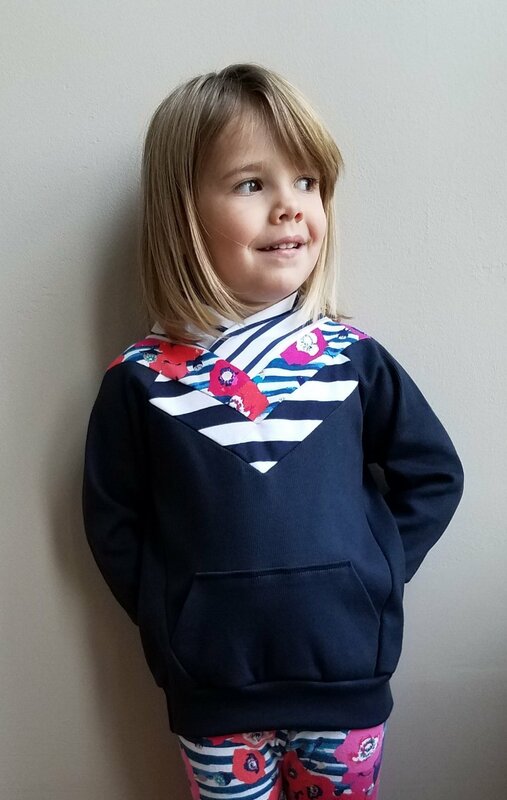 Origami is a unique and very creative children's wear design made to be sewn with knits. There's an optional kangaroo pocket for the sweater or dress lengths. I had a lot of fun playing with stripes on my version and used a contrasting rib for the inside of the collar. That pieced neckline is just ....pick a word- stupendous, amazing, incredible. If Elles' work is new to you, she has several free patterns you can try. There's also a Misusu Patterns Sew & Tell FB group for support, inspiration, and showing off your makes. The striped floral knit, Paparounes Crimson, is by Art Gallery Fabrics and is one of my all time favorites. It wasn't until I went to get modeled pictures of the sweater that I found the coordinating leggings I had made the year before in my daughters drawer. Sew perfect! Origami includes sizes 9-12m- 13/14y, but I'm hoping Elles will make an adult version for us. Don't you want one for yourself now too? I'll leave you with some more Origami Sweater inspiration from Instagram. Thanks for stopping by!